I knew all about the crash when I moved onto Boundary Street in 2003. Everyone in San Diego did. Twenty-five years earlier, the deadliest airline disaster in U.S. history occurred above our homes before we lived here. It’s still the deadliest in California. PSA Flight 182 and a Cessna collided mid-air over our North Park neighborhood. The perspective from the ground was shown afterward on the cover of TIME Magazine and newspapers around the world: The flaming Pacific Southwest Airlines jet carrying a hundred and thirty-seven passengers plunged towards what was now our backyards. A few neighbors who happened to look up when they heard a loud crunching sound saw the out-of-control jet careening to the right, fire and smoke shooting out from behind before the plane slammed into the earth at 300 miles per hour just behind my house. The explosion was instantaneous—an enormous fireball whooshed into the sky, a mushroom of smoke and debris. Scraps of clothing leaped onto telephone poles, body parts fell on roofs, tray tables scattered across driveways. Airplane seats landed on front lawns, arms and legs descended onto patios, and a torso fell through the windshield of a moving vehicle. While eerie, hot Santa Ana winds reportedly shot through the streets—the kind that make your hair crackle, your skin flake, your sinuses burn—metal pierced homes, chimneys, and people. The telephone pole on the corner of Dwight and Nile, jolted from the cement by the violent impact, still leans today. Twenty-two homes gone in a flash. Passengers and people, in their homes and on the street, dead. The accident was posed to me as a ghoulish fringe benefit by the previous owner of my house. I’d be able to say I resided in a place where the tragedy had occurred. I did my part to maintain the lore, relaying details I’d read online to curious visitors. Near downtown San Diego, North Park was a place I loved from the start. I fit in better than anywhere I’d ever lived—plain folk mixed with artistic types, working and middle class residing side by side, all colors and ages, gay and straight. Lanky palm trees towered above sidewalks, gardens brimmed with magenta geraniums, red bougainvillea spilled over old fences, the odd varieties of Dr. Seussian succulents stuck their tongues out across yards. I could be anyone I wanted and still be accepted, not like the house I’d grown up in. I worried about how the annihilation of these bodies that landed on my property would affect me. Would I feel engulfed by doom simply living on this patch of earth? I’d had bouts of depression. I didn’t need to think about dead families sprawled on my back patio, even if it had been decades. But while I’d never be cured of this incessant disease, my own particular strain had been restrained after too many years of therapy and a lifetime commitment to antidepressants. My husband’s had not. I met John, a tall man with magnificent broad shoulders that made me feel more petite than I was, three years after moving to North Park. He was playing piano in a popular local band at the Waterfront, San Diego’s best dive bar. I was twenty-eight, he two years older and so attractive he was embarrassing to look at—heavy eyebrows, eyes that saw through everything, a large mouth he’d been teased about in middle school but that nobody teased him about anymore. People hovered, drawn to him. A lot of the people were women. I was attracted to the light of his mania, though I didn’t know it at the time. When he teased out those keys, everything from boogie woogie to slow-rolling blues emerged. His eyes closed when he sang, his voice warm and husky, and he went somewhere fervid inside, somewhere that hurt, a place where his contorted expression could have meant pure euphoria, pure anguish, or both. I’d recently gotten out of a rotten marriage. It had taken me less than a year to discover my husband was every bit as controlling as my father. John dropped into a seat at my table the third time I went to hear his band. “What’s your name?” he said, teetering dangerously far back on the legs of his chair. He picked up my hand, drew a line with his finger up and down my digits. “What do you do, Lenora?” He gazed at me slowly from my feet all the way up to my face in a way I’d been taught was rude, but it felt okay coming from him. He grabbed my swinging foot under the table, let the shoe drop, rubbed the ball of my heel in slow movements, the kind that work muscles in an exhilarating mixture of pleasure and pain. I considered asking him to stop, but it felt too good. “I work for the local paper during the week,” he said. That sewed everything up right there. He let go of my foot and a faraway expression swept his face. “It’s complicated,” he said. We kept flirting until his next break, though I had a pit in my stomach. “Where do you live?” he asked, sitting again. I told him on his next break, “I don’t need to get in the middle of someone else’s crappy marriage.” I packed up my purse. “Don’t go,” he said, the front legs on his chair falling back to earth. Grabbing my jacket, I steered myself toward the front entry, but he was right behind me as I pushed through the glass door. The sea breeze smelled fresh and briny. I shot to my car, beeped to unlock, turned to say goodbye. His face was right there. I plunged into the front seat. His forearm leaned against the roof, framing his broody face. My car should already have been in gear; I should have been pulling onto the freeway by now. And then his knees sank to the sidewalk, and his mouth was on mine. During my absence, he’d been made local editor. “No one can believe I did it at thirty-one years old,” he told me. A flash of importance spread over his face. It looked good there. He turned his phone on, took a series of incoming calls from the paper, then apologized, and powered down. Despite the showing off, I admired his mind at work, a complex swarm of genius, a beehive of information as he rapidly worked his cell, talking story angles, problems with sources. We ordered red beers and were speaking loudly over the din, when he leaned over and said, “You must have missed me, huh?” winking. Our table suddenly became quiet. He kicked his foot. The despair on his face when he picked the label off his Dos Equis helped me understand he still wrote music that hurt. We made love and were together often during the next months. Sometimes he cried about Abby. His moods changed rapidly, but his having so many emotions was exciting after growing up with a father who seemed to have none. Maybe my own father wouldn’t have become so depressed if he’d left when he first grew unhappy. As it was, he was so dissatisfied with so much of his life, including me, that I turned into a girl who could never do anything right, who’d never be pretty enough, who had no sense of humor about jokes at my expense. My mother’s cocktails helped her pretend. Occasionally, I still felt like that girl—stupid, ugly, and fat, isolated, because who would want me? When I told John about this one night at dinner, he said, “Lenora, those things aren’t true. You can’t listen to him.” Then he leaned over and kissed me. John never knew when he could get away, but when he could, he came to me. I’d glance out my front window, and there he’d be. I was always glad to see him. I learned all about his breakdown when he was nineteen, the months he spent in the hospital, the diagnosis of bipolar. I learned about his mother committing suicide when he was fourteen. None of this made me want him less. His father had forbidden him from revealing to anyone his hospitalization or the way his mother died. I was the first person he told. Leslie caught him emailing me one night. She howled that he had to stop, that he couldn’t see me anymore. The second time, she screeched, “Then if she’s your soul mate, she can have you! Get out!” He got his own apartment for six months, then moved in with me. Leslie and Abby were heartbroken. John saw his daughter every chance he got, agonized when he couldn’t. I didn’t go with him since I knew she really wanted to see him, not me, as I had only wanted to see my father, not my stepmother, Philomena. John grew quieter and darker. What would I have thought if it had been easy for him to leave? Murmurings about the upcoming commemoration of PSA Flight 182 started in the summer of 2007. Would the city finally put up a memorial on the corner behind our house where the airplane hit? There was a plaque in the San Diego Aerospace Museum, and on the 20th anniversary, a tree was planted in front of the North Park library with another plaque. Neither was close to the site, though. Maybe even thirty years later it was still too raw a reminder of what happened here for folks going about their daily basis. The first we heard of our next-door neighbor, Archie, planning a neighborhood block party as a thirty-year remembrance of the crash was that November. Nobody worked the story of PSA 182 as hard as Archie. Tall and stringy, he came running over one afternoon with a worn manila folder just as we were getting in the car. Every chance he got, Archie explained to me even more specifically than the previous owner exactly where the plane had crashed—over our fences on Boundary Street—and in even greater detail how our homes had been affected. A statistician for the federal government, he wore his tangerine-colored hair pulled into a neat ponytail at the nape of his neck. Before we could even say hello, he spotted our garden hose, uncoiled and flopped across the garden. “Hoses wrapped up neatly in the holder make the whole neighborhood look better,” he said, catching his breath. “I’m going to garden more this afternoon,” I told him. I rolled my eyes at John when Archie wasn’t looking. John shrugged. He’d become more tolerant of Archie since he’d found out that he, too, suffered his own brand of hopelessness. About the only thing we had in common, besides living next door and owning houses that were the resting place for a lot of ghosts, was that both men had had recent run-ins with the black monster, who snuck up and took over when they weren’t looking. John’s father had tried to beat from him any natural acceptance of a different life, including the sin of playing his guitar instead of constantly practicing to be the town’s star quarterback. Our neighbor being so unswervingly out was something new for him. Archie’d had a serious boyfriend, but I hadn’t noticed the guy’s SUV lately. Instead, I saw a lone Archie wandering the neighborhood more frequently, knocking on doors. Above us that day on the driveway, a flurry of color—scarlet, turquoise, mustard—zipped past, shrieking and hustling, from one North Park palm tree to another. The brilliance of these neighborhood macaws flying through our Southern California enclave in formation, twenty-five of them together to forage for dates, could allow just about anyone to forget the rest of the world. Escapees from unlatched cages all over town, not to mention the zoo, they’d fled front doors left open only for a minute, chewed through screens when left alone too long, and now banded together to make North Park their home. “Wow,” John said as he and I stared so as not to miss any of the colorful show. “Cool!” Heather called from her apartment balcony next door, still in her pajamas. Her boyfriend wore a dog collar and waved. The five of us crinked our necks upward to watch the macaws until they’d all flown by. Shaking his head at the noisy birds, Archie opened his folder. “Look what I found at the public library,” he said, pulling out copy after copy of aerial views of the airline crash. “See right there?” Bending ninety-degrees beside my window, he pointed at a photo with our house in it. “Right by the carport?” he continued. “The people before you tore that down. See the crater on your lawn? Who knows what landed there? See?” He pointed to a spot in our yard. John, startled, dropped the car keys on the floor mat. He seemed unable to look away from our home’s scar. Archie took off, and we sat there. “Time to go, John,” I said. Finally he snapped out of it, but then we switched places so he wouldn’t have to drive. Who knows why that particular day was so hard when he already knew about the crash? Maybe it was because he now lived on the property, making him a part of it. My father, too, was a brother. In the seventies, he’d had Elavil and Librium. Weeks later when I called my dad, he said, “You mother says this John’s still married.” We rarely spoke. Email was far safer so I didn’t have to worry about his mood when he received it. I liked to think I’d gotten over him years ago, but talking to the man could still hurt. “Sounds familiar, doesn’t it?” I said. The following silence was riotous. “Give me a call when he’s your husband,” he said. John didn’t go down right away. Just the opposite. A few months after moving in, we went out with Alexa, a Greek painter I’d met down the street. Her husband Eduardo had to work late. “Is that a mustache?” John asked Alexa in the loud restaurant. A piano player chinked out music on the other side of the partition, and customers took turns singing with him. “Why would you say something like that?” I asked him. Until recently, I’d never seen this new, in-your-face behavior of John’s before. Unable to sit still, he said, “I’m going to sing,” and wandered off. Soon his voice was belting out over all the others. Fortunately, it was a good voice. He sang a passionate “I wish I was special”—“Creep,” by Radiohead. We left napkins over our dinners—John still hadn’t touched his—and leaned into the bar clapping while John sang “Stuck on You” by Elvis. Now he was standing on his bar stool. The bartender didn’t look pleased, but everyone was buying drinks, so nobody said anything. The elderly lady asked him to dance when the microphone moved on to someone else. “I’ll take a cab.” He didn’t seem to mind at all that we were leaving him behind. “Is everything okay?” Alexa asked on the drive home. At 3:00 a.m. a policewoman dropped him off at the curb in front of our place. I didn’t know what he might do next. As this energy continued, I became increasingly sure we weren’t going to make it. I asked one morning, “Don’t you think you should see a doctor, hon?” Most of our house had been redone since 1929, except for our kitchen. It wasn’t quaint. It was small with broken plumbing. We bumped into each other a lot. “Is this mania?” I waited until the microwave said my coffee was ready. “I feel great. No way I’m coming down on purpose.” He was off to take Abby for a haircut and then to a birthday party. Afterwards he had a tee time with a friend. This seemed fine until I got home one afternoon and he was at the dining table with legal pads scribbled all over. There were three half-drunk cups of coffee. I found out soon enough he was on the phone with Tim O’Brien. I was spellbound. How did someone get Tim O’Brien on the phone? I tiptoed away, lay on the couch while they talked another half an hour. Then he called Chuck Palahniuk. I took a deep breath, worn out from the last conversation. “You were a diesel mechanic?” John said. Sometimes the thought of a boyfriend who liked to watch mystery movies together at night and doze off on the couch seemed tremendously appealing. How he got them to talk wasn’t as confusing. At full-tilt, John was hard to resist. Had I ever been attracted to normal, breadwinning, logical men? A month or two later, John came home with five computers, one for him for work-related issues, one for his personal use, one for me, one for Abby, and one for guests. “Where are we going to put them all?” I asked. Fortunately, just as quickly as he’d left me for some other planet in the stratosphere, he was back. For a while, he could be counted on again. My old love had returned. He reveled in salvaging egg-shaped doorknobs from architectural hardware stores to match the era of our house, built archways in our doorways to go with the Spanish mission style. It was his way, since he’d moved in after me, of owning part of what the house was all about. “Lenore, Lenore . . .” I said, laughing. Abby spent a night with us most weekends. At eight years old, she wanted to sit on her dad’s lap constantly. Leslie dropped her off one evening before John got home. The dogs and cats surrounded Abby, and she sat on the hard-wood floor, giggling, let them lick her face and hair. “Are these your children?” she asked. “Jello!” she said, in a voice younger than her years. Maybe she was trying too hard, too. Twenty minutes later when John walked in, she was standing on an aerobics step, mixing in the apple we’d cut up. “There’s my girl,” he said. She dropped everything, jumped off the step, and flew over to hug his legs. It made me happy to see him happy. Occasionally he still cried about leaving her, and I felt awful. I wondered if my father had cried after he left. Maybe I just hadn’t known. Maybe I should have encouraged John to go back. Towards the end of the year, the Friday after his divorce was final, we decided to drive up to Big Bear and get married. What would it have been like to marry a regular guy who wore a suit every day and expected the house to be neat? What if I’d had to go to company picnics and be polite to assholes because they were my husband’s bosses or have parties with wives I had nothing in common with? I’d rather die. So, yes, John felt deeply about Abby, tended toward the melancholy and the other extreme, but he was real. He let me be me. We drove the long way to Big Bear, up the coast, then tracked down a wedding consultant, who turned out to be new age. We wrote poems for each other. That night was one of the happiest in my life. We made love, went out to dinner, made love again. “Nobody else has mentioned anything,” I told him. He’d complained about other things, Abby leaving a couple of toys on the lawn, our cat eating his feral cat’s food. “But if the cats are outside and you feed them there, I don’t see what I can do,” I said. Secretly, Archie loved our cat visiting him. “You just going to sit there, girlfriend, while I scratch your head?” I overheard him telling her. He liked the dogs, too. The solution to barking? Give him a key and permission to lock them in our house if they were barking and we weren’t home. After that, I saw signs of Archie visiting the animals, balls thrown across the lawn, leftover rinds from oranges he must have fed the dogs from his tree. One time when I drove up after teaching, John was inside playing “Hotel California” on the piano, and I spied Archie through the fence cooing and kissing them. It was that empty house of his, him and all those phantoms. He’d become something of a ghost himself. He rocked on his feet, alluding to Archie’s recent hospitalization for depression. John had immediately gone to see him when we found out, but I was working. Despite the complaints, I felt for the man. We knew he wasn’t HIV positive, so I wondered why he hadn’t gained enough weight back after being discharged that winter and spending several weeks at home. “I’m okay,” Archie said quickly. All of our heads rotated upward to our North Park palm fronds as macaws roughhoused with massive chatting and squawking. A fledgling pecked the beak of an older bird, who pecked back, a duel to the death, only they weren’t pecking very hard. Still another dive bombed one of my cats in the side yard then swooped militia style back up to the tree, squealing in laughter, swinging upside down from a frond. Regardless of what the talk turned to among the neighbors, though, we rarely invited the others inside. Without an official gathering, it seemed too intimate. By March of 2008, though there were still six months to go until the thirtieth anniversary of Flight 182 being hurled onto our street from above, our North Park neighborhood was abuzz. The owner of our corner bodega ruminated over a carton of eggs about how such a wretched accident had ever occurred. Where were the air traffic controllers? The mailwoman had been leaving for school and saw the black smoke. The SDG&E meter reader was in elementary school looking out the windows at the falling ashes. The telephone repairman saw it on the news in Washington, where he grew up. As if calibrated by some mysterious clock, as soon as the anniversary began to be talked about, John started drinking more. He sank, slept too much, lost weight, didn’t want to do anything. Now that we were married, he’d brought a dining room table from his old house, an ancient chair that rocked too far back, a framed picture of his favorite Uncle Oba sitting in the cockpit of his plane that went down in Vietnam and wearing a green Air Force jumpsuit and a helmet with an oxygen mask, his eyes smiling. The dining table stayed, the chair went, Uncle Oba watched everything we did. John began blaming the fiery metal nightmare plummeting from the sky for causing such a ravenous reoccurrence of despair in him. He was sure there was a parallel to the anniversary. He stopped returning phone calls. “But Abby doesn’t understand why you won’t talk to her,” I said. “It’s not good for her to see me like this.” He bunched up under his covers, the curtains closed all weekend. He told Leslie to tell Abby he loved her, but he was sick. Sometimes when John became particularly low he disappeared on long walks. The airplane disaster carefully consigned to a back corner of my mind, I searched desperately to understand and not be so afraid when John sank even lower into the black hole. BONNIE ZOBELL lives in a casita in San Diego with her husband, dogs, cats, and many succulents. 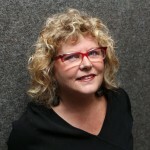 She is the author of The Whack-Job Girls (Monkey Puzzle Press, 2013), and is a recipient of an NEA Fellowship, a PEN Syndicated Fiction Award, the Capricorn Novel Award, a spot on The Wigleaf Top 50 (Very) Short Fictions, and a notable story included in the storySouth Million Writers Award. Her fiction has appeared or is forthcoming in such magazines as The Potomac Review, Connotation Press, The Los Angeles Review, PANK, and The Greensboro Review, and she has been a fellow at Yaddo, MacDowell, VCCA, Dorland Mountain Arts Colony, The Wurlitzer Foundation, and Villa Montalvo. 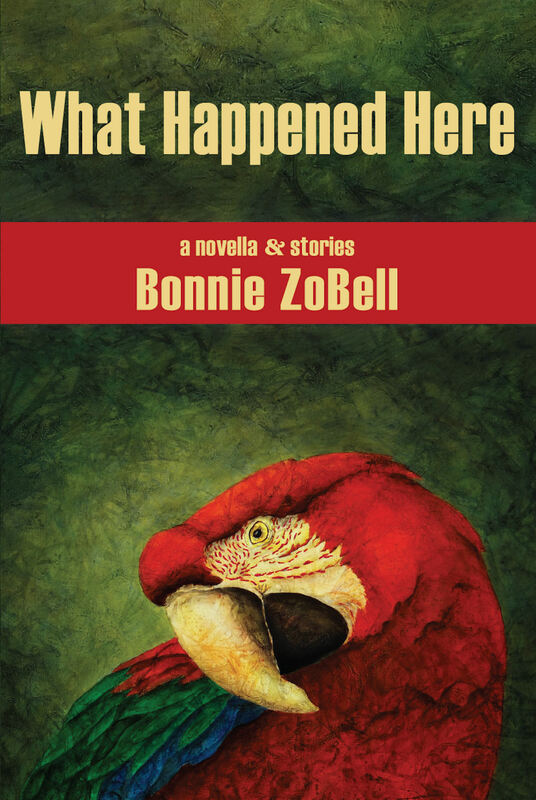 ZoBell received an MFA from Columbia University and currently she teaches at San Diego Mesa College. She is an Associate Editor at The Northville Review and at Flash Fiction Chronicle, and is working on a novel. 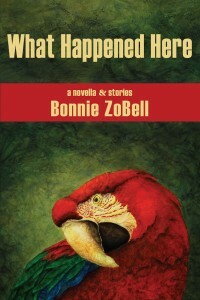 Her website is www.bonniezobell.com. I’ve read the book and adore it. I re-read the excerpt here and was equally thrilled by a scenario that is so bizarre it could only happen in real life or fiction. What is real and what is blended has come across so well in this book that I will never forget the ‘parts’ falling from the sky and landing in trees and, well, everywhere. BRAVA Bonnie!!! This is a great excerpt, this book was just officially moved to the top of my reading list. Cannot wait!